The Leader in Me is a fun leadership-development program just for kids in grades 1-6! Designed to help develop the essential life skills and characteristics kids will need in the future, “The Leader in Me” students will learn about leadership skills, self-confidence, and “7 Habits” that will help them succeed. This Level 1 The Leader in Me: Annotated Teacher's Edition is designed to be used with the Level 1 The Leader in Me Activity Guide (not-included and sold-separately). The "Leader in Me" series is designed to help develop the essential life skills and characteristics elementary-grade students will need in the 21st century, including leadership skills, self-confidence, and the "7 Habits" introduced in the book "The 7 Habits of Highly Effective Teens" by Sean Covey (also sold-separately). Lessons feature 10-minute activities that will help students reflect on their lives, develop leadership skills, and set goals that will inspire them to succeed. This program uses additional children's literature (listed below), which will need be to obtained separately. This resource mentions access to an online "Teacher's Lounge;" this online resource is no longer offered by Franklin Covey and is not included with purchase. 54 pages, softcover, spiralbound. Grade 1. The Leader in Me is a fun leadership-development program just for kids in elementary grades! Designed to help develop the essential life skills and characteristics kids will need in the future, students will learn about leadership skills, self-confidence, and "7 Habits" that will help them succeed. 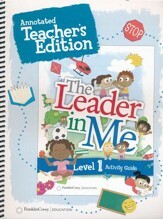 The Leader in Me: Level 4 Activity Guide features full-color activity pages. The book begins by introducing the "7 Habits" (e.g. Be Proactive, Begin with the End in Mind, Put First Things First) and includes a section with foundational activities to help children think about habits, paradigms and principles. The following worksheets are based around each habit, and include drawing activities, charts and graphic organizers, and critical thinking and reflection questions. Worksheets also teach students about leadership tools such as flowcharts, lotus diagrams, plus/delta charts, line charts, bar charts, venn diagrams, brainstormers, and other ways of working through, presenting, and tracking information. Lessons are provided in the Level 4 Teacher's Edition (not-included and sold-separately). 54 pages, softcover. Consumable and non-reproducible. Grade 4. 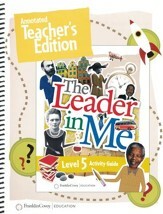 This Level 5 The Leader in Me: Annotated Teacher's Edition is designed to be used with the Level 5 The Leader in Me Activity Guide (not-included and sold-separately). Lessons feature 10-minute activities that will help students reflect on their lives, develop leadership skills, and set goals that will inspire them to succeed. This is a flexible program and activities can be assigned daily, semi-weekly, or weekly. Student pages are reduced and included in this teacher's guide, with the margins filled with helpful teacher notes. Teacher guidance includes: a key concept, a key principle, "baby steps," discussion question(s), "across the curriculum" cross-curricular connections, and kinesthetic activities. 54 pages, softcover, spiralbound. Grade 5. 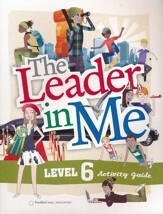 The Leader in Me: Level 6 Activity Guide features full-color activity pages. The book begins by introducing the "7 Habits" (e.g. Be Proactive, Begin with the End in Mind, Put First Things First) and includes a section with foundational activities to help children think about habits, paradigms and principles. The following worksheets are based around each habit, and include drawing activities, charts and graphic organizers, and critical thinking and reflection questions. Worksheets also teach students about leadership tools such as flowcharts, lotus diagrams, plus/delta charts, line charts, bar charts, venn diagrams, brainstormers, and other ways of working through, presenting, and tracking information. Lessons are provided in the The Leader in Me Level 6 Annotated Teacher's Edition, (First Edition) (not- included and sold-separately). 54 pages, softcover. Consumable and non-reproducible. Grade 6. 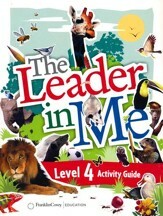 This Level 6 The Leader in Me: Annotated Teacher'sEdition is designed to be used with the Level 6 The Leader in Me Activity Guide (not-included and sold-separately). 54 pages, softcover, spiralbound. Grade 6. This resource mentions access to an online "Teacher's Lounge;" this online resource is no longer offered by Franklin Covey and is not included with purchase . 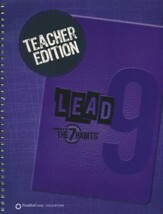 The Lead 9 Teacher's Edition is designed to be used with the Lead 9 Student Journal (not-included and sold-separately). 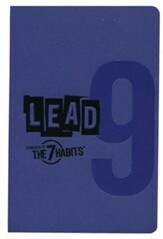 The "Leader in Me" series is designed to help develop the essential life skills and characteristics students will need in the 21st century, including leadership skills, self-confidence, and the "7 Habits" introduced in the book "The 7 Habits of Highly Effective Teens" by Sean Covey (also sold-separately). Lessons will help students reflect on their lives, develop leadership skills, and set goals that will inspire them to succeed. This is a flexible program; lessons are offered in 15, 30, and 60-minute increments. The 40 total lessons can be covered in a period, semester or full school year. Student pages are reduced and included in this teacher's guide, along with helpful full-page teacher lessons. Teacher guidance includes: a key concept, key questions, and a 15-minute, 30-minute, and 60-minute lesson that include scripted questions and answers and directions, along with a formative assessment. 120 pages, softcover, spiralbound. High School. 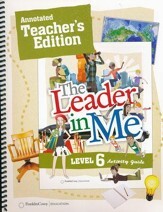 This resource mentions access to a "Teacher's Lounge" and "Web Connection: The Leader in Me Online" resource; this online resource is no longer offered by Franklin Covey and is not included with purchase. The Leader in Me is designed to help develop the essential life skills and characteristics students will need in the future. This course teaches leadership skills, self-confidence, and "7 Habits" that will help them succeed. This full-color workbook journal is filled with reflection exercises plus stories and real-life situations from teens around the world. This book cannot be used without the Lead 9 Teacher's Guide (not-included and sold-separately). 111 pages, softcover. Consumable and non-reproducible. High School.